Home » Apple , Mobile , windows » TellME vs SiRi The Personal Voice Assistants War. TellME vs SiRi The Personal Voice Assistants War. who don't need a golden mobile ? which can do anything (with some limitations), whatever you say.. like your pet ! yes i'm talking about The Personal Voice Assistant . 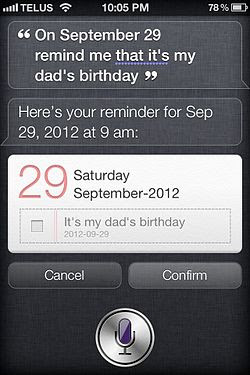 Siri is an intelligent personal assistant and knowledge navigator which works as an application for Apple's iOS. that's why people are crazy to buy apple's iphone 4s . okay,so recently Microsoft launched its own branded Voice Assistant called "TellME" it works like Apple's SiRi Voice Assistant ,which would work hand in hand with Windows Phone 7 Mobile operating system . i'm sure you might be quite excited to know which is better voice assistant ? Microsoft's TellME ? or Apple's Siri ? 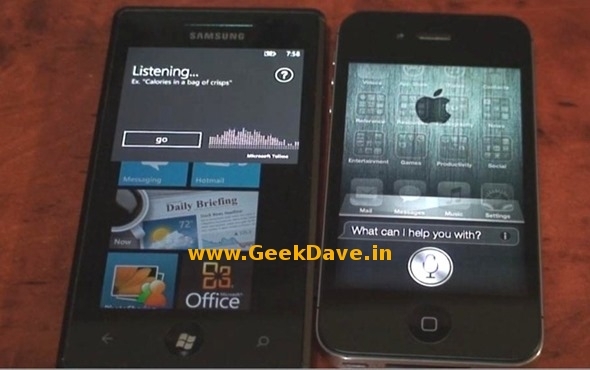 so here is a Video comparison between Microsoft's Tellme and Apple's Siri. The results speak for itself ! Siri won this Game !